There's an old custom to bless your home on Epiphany which is celebrated this year on Sunday, January 3, 2016. Most use chalk for marking the front door as part of this house blessing. Here's a prayer for blessing your house this weekend. Simplify the ritual as your needs and circumstances suggest! All gather at the front door and one person is chosen as the Leader of prayer. Peace be with this house and with all who live here. Blessed be the name of the Lord, now and forever. to the Magi and all the nations. and his presence makes our home a holy place. 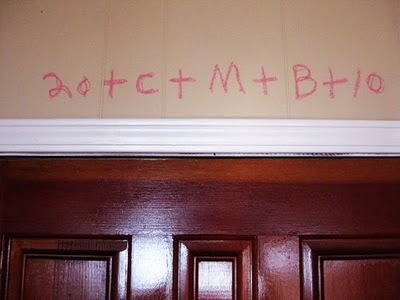 The traditional marking of the doorway commemorates the three magi (traditionally named Caspar, Melchior, and Balthazar) and gives the calendar year already recently begun. and the Word was with God, and the Word was God. and without him nothing came to be. and let us dwell here together in peace. If you have holy water at home, you might sprinkle each room. by the guidance of a star. Bless this house and all who live here. and perhaps enjoy some refreshments or dinner! 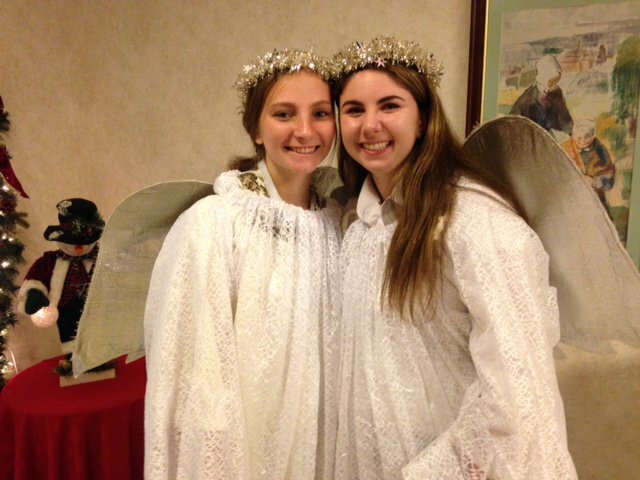 Yearly the Marianist high schools travel to celebrate Christmas in a variety of ways. This yearly we traveled on Sunday, December 27 to assist in the Christmas pageant with the Little Sisters of the Poor and their elderly. A great inter-generational event allowed us all to ponder a simple but valuable lesson on "the true message of Christmas." 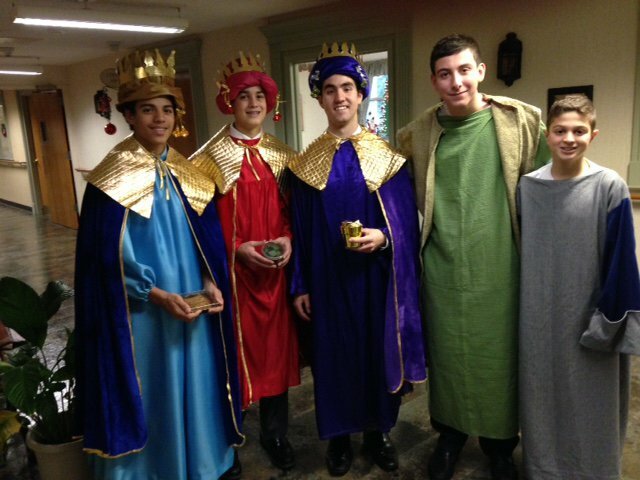 Christian tradition holds that these Magi (kings from Persia) were named Balthazar, Gaspar and Melchior. And the angel said to them, "Fear nor: for behold, I bring you tidings of great joy." 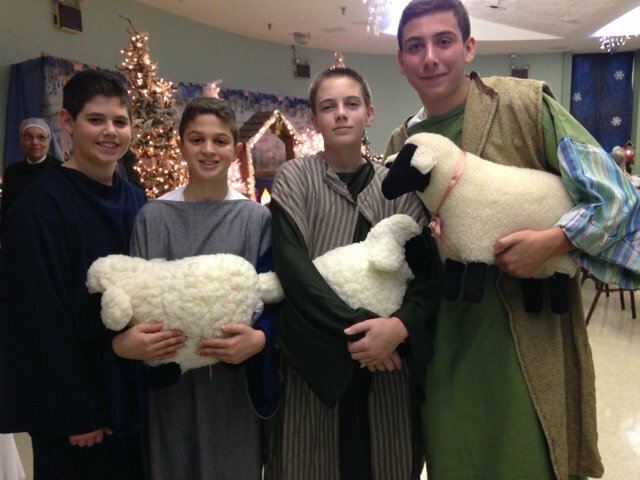 "The shepherds returned, glorifying and praising God for all the things they had heard and seen." The one thing God asks of us..
One of my favorite Advent books is A Child In Winter: Advent, Christmas and Epiphany with Caryll Houselander. It draws on all of Houselander's writings and is beautifully edited by Thomas Hoffman. His whole heart is concentrated on you. because it fallen and bruised herself? No, indeed; only (if that is possible) more! Let Christ speak to you. prove to you that he is real. are all the courtesy of God's heart flung down on you! "See how I love you." not as someone who does not really exist. And the golden rings and the turtle doves. Taking the garbage out and keeping the sidewalk shoveled. There is much we do not understand. In this small singer holding onto my hand. And are there angels singing overhead? Hark. There are different readings (and prayers) for the "Four Masses of Christmas" celebrated at: the Vigil, in the Night, at Dawn, and in the Day. One way to prepare for celebrating Christmas is to take a look at how the four gospels present the birth, the origin of Christ. This post provides those texts for you, below. - that Luke's account never mentions the wise men? - that Matthew's account doesn't mention the shepherds or a manger? - that neither Mark nor John includes the story of Jesus' birth? A little comparative study here may provide some surprises - and give you some good trivia questions for Christmas gatherings! Isn’t it interesting that here is a man of God, a priest no less. One that is described as faithful and blameless. His wife is the same way. He is an old man who never wavered or wondered away from the religious life of his calling. He finally gets the chance of a lifetime to enter the temple’s holiest area, and he encounters a messenger from God… and he’s surprised, startled, and scared! It’s almost like that’s the last thing he expected to happen to him while in this holy place. Even the faithful may grow dull in their expectations, however. That’s just what happened to old Zechariah that day in the temple. God broke through, broke in, startled the unexpectant Zechariah and said, “Your prayer has been answered.” Could there have been anymore stunning news than that? The personal prayers of Zechariah and Elizabeth were about to be answered. They were going to have a son. Their shame cast off once and for all. Their hopes of carrying on the family name. The corporate prayers of all Israel were being answered. Israel was going to receive a prophet who would turn the hearts of the people back to God. It would be John who would prepare for the way for the Lord and make straight paths for him. Every valley would be filled and every mountain and hill made low. The crooked roads made straight and the rough places plain. And all mankind would see God’s salvation. The old man’s prayers were going to be answered. The hopes and fears of all the years are met in this revelation of grace. It’s a reminder and lesson for Christmas past, present, and future to hold on to old prayers. Maintain hope in the midst of darkness. Keep hopeful expectations burning even when the dullness of years seems to cloud their light. But in the presence of this good news, Zechariah just can’t bring himself to accept it at face value. Upon hearing the hope he responds, “How can I be sure of this? I am an old man and my wife is well along in years.” He wants a sign. He wants to be sure. Zechariah asks, “How can I be sure of this?” He’s not seeking an explanation. He’s seeking evidence. I want to be sure. I want to be certain. Give me more evidence. Which, of course, the angel did by shutting his mouth for the next 9 months until John was born. And so it came to pass. 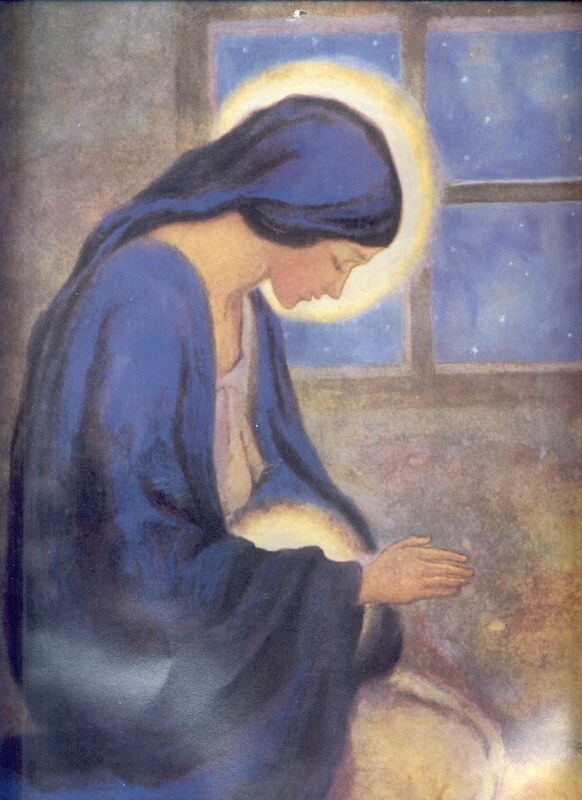 Three months before the birth of Christ to a virgin, came the birth of John his cousin to a mother “well along in years.” Elizabeth simple said, “The Lord has done this for me. In these days he has shown his favor and taken away my disgrace among the people.” God did it. Not when Zechariah and Elizabeth thought he would do it. In fact, it’s quite likely they never thought such a wonderful thing would happen. They had resigned themselves to go faithfully to the grave barren, ashamed, yet upright in the sight of God. But God did it in his time. And so the call for you and me is to keep the flame of hopeful expectations burning. Enter into the presence of God when it’s God’s time for us to come. In the midst of our long years of uprightness and keeping the Lord’s commands blamelessly, we keep expecting God to do God-like things. In these final days of Advent, the Church shifts her focus from the advent of Christ at the end of time to preparing for Christmas. In a particular way, this Sunday we are invited to reflect on Mary, the Mother of Jesus. In the story of Mary’s visit to her elderly kinswoman, Elizabeth, we are presented with two women who are living in expectation. Elizabeth, pregnant with John the Baptist, and Mary, carrying God within her, embody the hopes and expectations of Israel. Theirs was a waiting full of promise: “People who have to wait have received a promise that allows them to wait. They have received something that is at work in them, like a seed that has started to grow” (Henri Nouwen, from the essay “A Spirituality of Waiting”). This kind of waiting is never a movement from nothing to something. Rather, it is a movement from something to something more. In his own time, God had called the holy men and women and prophets — Abraham, Sarah, Moses, Ruth, David, Isaiah, Jeremiah, and so many others — to prepare the way for his Son. 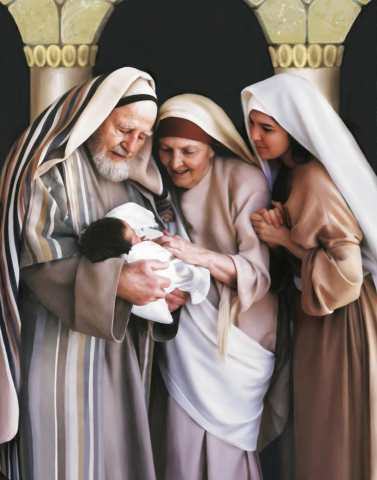 And in Mary and her Child, the promises, hopes and expectations of God’s chosen people were finally being fulfilled: “from you shall come forth for me one who is to be ruler in Israel; whose origin is from of old, from ancient times … he shall stand firm and shepherd his flock” (Micah 5:1, 3). For centuries, a sign of God’s covenant promise to Israel through the centuries was the ark of the covenant. The ark was an icon of God’s presence, a reminder that God was in their midst, accompanying the people as they wandered through the desert and fought to claim a home and identity (cf. Numbers 10:35–36). Mary became the new, living ark of the covenant, who carried God within her. In Mary, God was now present in a person, in a heart. And just as David danced before the ark of the Lord (2 Samuel 6:14), John the Baptist, still in Elizabeth’s womb, leapt for joy because the Lord had come. In these last days of Advent, Mary teaches us how to receive the Word of God, whose coming we celebrate at Christmas. As Saint John Paul II observed, “She exhorts us, first of all, to humility, so that God can find space in our heart, not darkened by pride or arrogance. She points out to us the value of silence, which knows how to listen to the song of the angels and the crying of the Child, not stifling them by noise and confusion. Together with her, we stop before the Nativity scene with intimate wonder, savoring the simple and pure joy that this Child gives to humanity” (Angelus, December 21, 2003). Offer a prayer of thanks for those who bring joy to your heart and who have handed the gift of faith to you. How are you being called to carry Christ to the world this Christmas? How does Mary’s humble service challenge you to live your faith in a more dynamic way during these final Advent days and throughout this Year of Mercy? Imagine that you’re in God’s presence. Now just be with God. Time to open up the Advent scriptures for Sunday one more time before we celebrate Christmas! 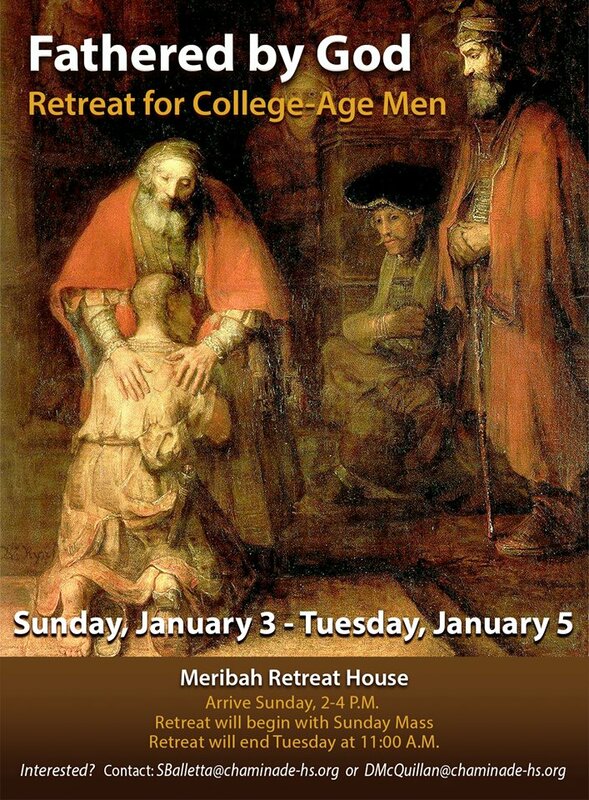 This coming weekend brings us to the Fourth Sunday of Advent. The first Scripture is from the prophet Micah who makes here his only appearance in the Sunday readings. Micah addresses insignificant Bethlehem to say that from such a small town shall come forth one whose greatness will reach the ends of the earth. The passage ends with the awesome words: "He shall be peace." The second reading, from Hebrews, reminds us three times that Christ came to do God's will. This texts sounds neither "Adventish" nor "Christmassy." Rather, it's a blunt reminder of why the Word became flesh in Christ: to save us from our sins. Advent's fourth Sunday gives us a Gospel with Mary, the mother of Jesus, as a central character. Here, we read the story of the Visitation - the visit Mary made to her kinswoman, Elizabeth, who was pregnant with John, who would become the Baptist, while Mary was carrying Jesus. From this passage in Luke comes a portion of the prayer, Hail Mary. The Advent message comes out of our encounter with God, with the gospel. It is thus the message that shakes – so that in the end the entire world shall be shaken. The fact that the son of man shall come again is more than a historic prophecy; it is also a decree that God’s coming and the shaking up of humanity are somehow connected. If we are inwardly inert, incapable of being genuinely moved, if we become obstinate and hard and superficial and cheap, then God himself will intervene in world events. He will teach us what it means to be placed in turmoil and to be inwardly stirred. Then the great question to us is whether we are still capable of being truly shocked – or whether we will continue to see thousands of things that we know should not be and must not be and yet remain hardened to them. In how many ways have we become indifferent and used to things that ought not to be? Here is the message of Advent: faced with him who is the Last, the world will begin to shake. Only when we do not cling to false securities will our eyes be able to see this Last One and get to the bottom of things. Only then will we have the strength to overcome the terrors into which God has let the world sink. God uses these terrors to awaken us from sleep, as Paul says, and to show us that it is time to repent, time to change things. We must do this with a decision that comes out of the very horrors we experience. Because of this our decision will be unshakable even in uncertainty. It’s the song heard ‘round the world’. “Oceans” not only held onto a spot on the Billboard Christian Songs chart for two years, it became the first Christian chart-topper to break into the Billboard Top 100. Taya Smith’s ethereal voice is mesmerizing, but it’s her passion that really carries the song. The group behind the hit began in 1988 as the worship band for a small church in Sydney. Now with eleven live and four studio albums, they have become a global phenomenon and a household name. They say their purpose is “to passionately seek and worship God,” and it seems they’ve inspired millions of others along the way. It’s the song of Peter venturing into troubled waters. The song of missionaries who left everything and everyone they knew, knowing they wouldn’t come back. It’s the Christians in the Middle East. The girl discerning religious life. The guy who goes to school and doesn’t compromise his faith. 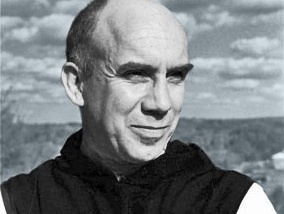 The agnostic who dares to take a leap of faith. Spirit, lead me where your trust is without borders. Let me walk upon the waters wherever you would call me. Like Peter, our feet may fail but Christ will not. I will call upon your name and keep my eyes above the waves. When oceans rise I will rest in your embrace. The story of the Annunciation is probably the most familiar and famous account of an angelic encounter. The Virgin Mary is visited by Gabriel, the messenger from God, who invites her response to the news that she will bear God’s son. Her humble and simple “Let it be to me according to your word” echoes down through the ages as a response not of mindless submission, but of a simple love to the invitation by the greatest Love. I remember stopping for a long time one day to look at a little plaque on the wall of a house in the Via degli Artisti [Rome], representing the Annunciation. An angel and a young girl, their bodies inclined toward each other, their knees bent as if they were overcome by love, “tutto tremante,” gazed upon each other like Dante’s pair; and that representation of a human love so intense that it could not reach farther seemed the perfect earthly symbol of the love that passes understanding. This message from God to our world is not simply the message of an angel, but a message incarnate in a human person. Jesus Christ is God’s message of love in the world. Other religions may claim that their holy book is the message of the angel Gabriel. Catholics know that the true message of Gabriel is not a book of rules and regulations, but a person. If the message is a person, not just a rulebook, then that person invites us into a relationship. In Mary’s Son God’s love incarnate reaches out to us and demands a response. The reason why the scene of the annunciation is depicted so often in art and poetry is because art and poetry are the best ways to express the emotions that surround this extraordinary event. We may contemplate the event and analyze the event theologically, but in the end the annunciation must be entered into by pondering with awestruck minds and hearts the true depth and astounding meaning of what took place. God entered this world not as a mighty warrior, vengeful judge or almighty creator but as an innocent child born of a young woman. Advent is therefore the time to meditate on this mystery and enter into this love not only with our minds but with our hearts. Muir’s encounter in Rome with that ordinary artwork inspired a poem that takes us to the mysterious heart of history’s greatest angel encounter. The angel and the girl are met. Earth was the only meeting place. Travelled beyond the shore of space. The eternal spirits in freedom go. That from their limbs all movement takes. Each feather tremble on his wings. And hoarsely grinds its battered tune. As if their gaze would never break. There is an abundance of folksy Christmas traditions around the world. 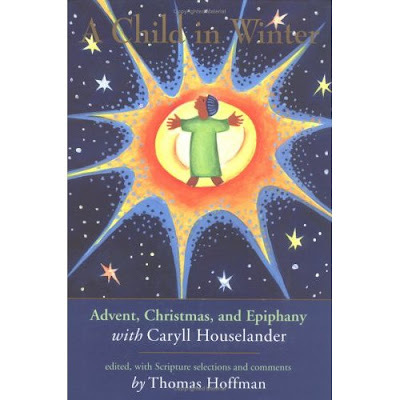 Some of them stir our hearts into a deeper appreciation of a holy and joy-filled season. Since I’m an outdoorsy kind of gal, I am partial to the Christmas traditions and legends involving animals and nature. A couple of Scandinavian countries have delightful customs. In Norway on Christmas Eve, a bowl of porridge is left in the barn for the Nisse, a gnome that protects the farm and its livestock. In Finland, sheaves of wheat are tied to branches for birds to eat during Christmas. Another tradition, not just in the Scandinavian countries, is the sprinkling of bird seed on the front step. If all the seed is eaten by nightfall, goes the tale, the family will be blessed throughout the coming year. The wreaths, swags and garlands we use to decorate our homes and churches are made from several kinds of evergreen boughs, each having its own symbolic meaning: fir,a lifting up; cedar, incorruptibility; spruce, hope in adversity. One evergreen that has special meaning at Christmas for farmers is the juniper. Throughout Europe swags can be found hung on stable and barn doors, and boughs are sometimes tied to wagon tack of burros. The genus Juniperus in Christian history and art, symbolizesprotection; their branches are prickly and harsh, and the aromatic sap at the tips of the needles can for some folks cause a rash. The juniper was an essential element in early monasteries. Their branches were used in the asperges of the congregation because of the abundance of holy water held by its needles, and its symbolism evoked a sense of further protection within the blessing. Their branches were also burned as incense and used medicinally for its anti-bacterial properties. There is a legend about the giant juniper tree, Juniperus thurifera, a massive native tree in the Holy Lands, with its role in the safety of the Holy Family. We recall that day on December 28, the Feast of the Holy Innocents. The tale begins with soldiers pursuing Joseph, Mary and the baby Jesus. Frightened by Herod’s men in close pursuit, the donkey upon which the Holy Family rode turned and at nearly full gallop headed toward the giant juniper. Miraculously, the tree opened up its branches like arms and enfolded them. There, in the shadows of the tree, they were safely hidden from the pursuing soldiers. In gratitude, Mary gave the tree her blessing, and some say Joseph, to sooth the trembling beast after the soldiers had passed, brushed the sweat from the frightened donkey with a juniper branch. The origin of the story is unknown, but the rural custom still exists today in America: on Christmas morning farmers hang juniper boughs — tied with dark red cords, symbolic of the blood of Christ and the Holy Innocents — on the doors of stables and barns. How wonderful that Our Lady of Guadalupe appears as a pregnant woman clothed in the sun! In the book of Revelation, Mary is described in just this manner (Rev 12:1). But we should not approach this symbolism in a superficial or merely sentimental way. The woman clothed in the sun and with the moon at her feet is portrayed in Revelation precisely as a warrior. Confronting her is a terrible dragon intent upon devouring her child as soon as it is born. Through God’s grace, the child is in fact delivered from danger, but the dragon is furious, sending a torrent of water from its mouth to sweep the mother and child away. In the wake of the child’s birth, moreover, a war breaks out in heaven between the dragon and Michael and his angels. The Lady of Tepeyac is a warrior as well. To Juan Diego she said, “I am the ever Virgin Mary, Mother of the True God.” In so saying, she was actively de-throning and de-legitimizing any false claimant to that title. Standing in front of the sun and upon the moon, with the stars of heaven arrayed on her cloak, the Lady was showing her superiority to the cosmic elements worshipped by the Aztecs. The gods in question were blood-thirsty divinities, sanctioning imperialistic war and demanding human sacrifice. Mary announced herself as the mother of a God who demanded no violence, and who instead took upon himself, as an act of love, all of the violence of the world. She was thereby effectively calling out the false gods in the name of the true God. To be clear, in condemning the gods worshipped by the Aztecs I am by no means exonerating the Spaniards, who committed numerous atrocities and visited tremendous suffering upon the native peoples of the New World. Read the impassioned writings of the Dominican Friar Bartolomé de Las Casas for the terrible details. Far too rare were Spaniards who were actually faithful to the God whom Christianity authentically proclaimed. What followed the apparition at Tepeyac is, of course, one of the most astounding chapters in the history of Christian evangelism. Though Franciscan missionaries had been laboring in Mexico for twenty years, they had made little progress. But within ten years of the appearance of Our Lady of Guadalupe, practically the entire Mexican people, nine million strong, converted to Christianity. La Morena had proved a more effective evangelist than Peter, Paul, St. Patrick, and St. Francis Xavier combined! And with that great national conversion, human sacrifice came to an end. She had done battle with fallen spirits and had won a culture-changing victory for the God of love. The challenge for us who honor her today is to join the same fight. We do not sufficiently engage this great feast if we simply wonder at a marvelous event from long ago. We must announce to our culture today the truth of the God of Israel, the God of Jesus Christ, the God of non-violence and forgiving love. And we ought, like La Morena, to be bearers of Jesus to a world that needs him more than ever. Bishop Robert Barron is an auxiliary bishop of the Archdiocese of Los Angeles and the founder of Word on Fire Catholic Ministries. 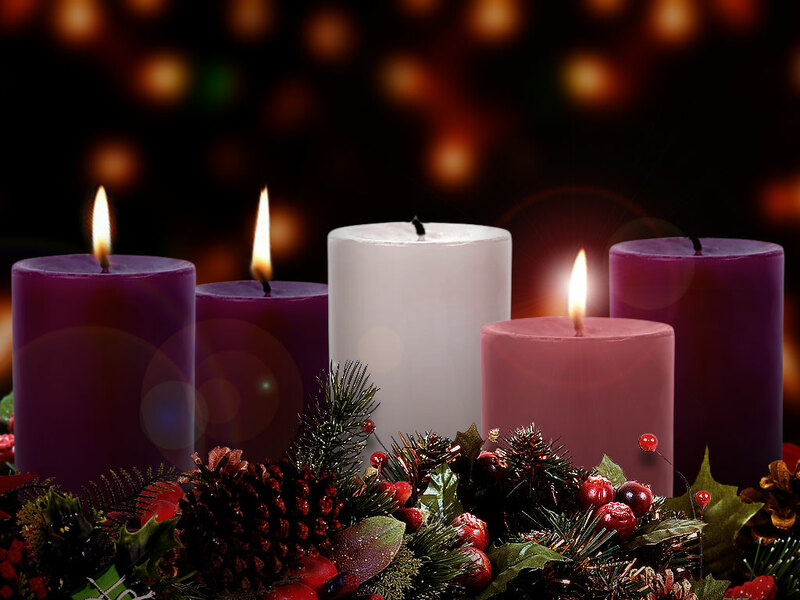 If you have an Advent Wreath at home, pray for joy in this third week of the season as you light the first and second and third (rose) candles each day. 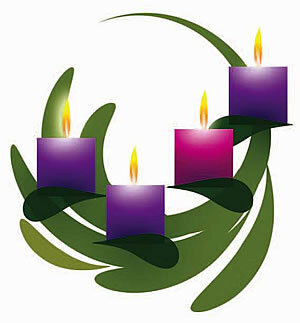 If you don't have an Advent Wreath - light any candle and pray for faith. Towards the four parts of the starry universe. Time falls like manna at the corners of the wintry earth. More wakeful than the patient hills. And intellects are quieter than the flocks that feed by starlight. Oh white full moon as quiet as Bethlehem! Advent is a time to prepare and the best way to prepare for Sunday worship is to spend some time with the Scriptures we'll hear proclaimed that day, that we might better understand, appreciate and take in the nourishment God's Word has to offer us. "How much wrong we do to God and his grace when we speak of sins being punished by his judgment before we speak of their being forgiven by his mercy." "We have to put mercy before judgment, and in any event God's judgment will always be in the light of his mercy. 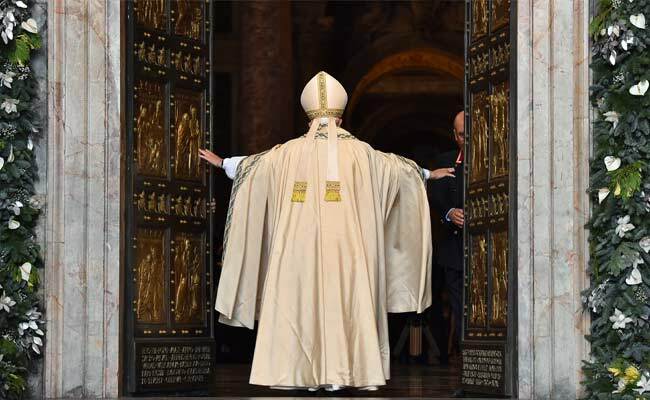 In passing through the Holy Door, then, may we feel that we ourselves are part of this mystery of love." The Year of Mercy, the pope stressed, is a gift of grace that allows Christians to experience the joy of encountering the transforming power of grace and rediscovering God's infinite mercy toward sinners. Today we celebrate the patronal feast of the United States, The Immaculate Conception. Mary was chosen by God to be the mother of Jesus, but “we too… are chosen by God to live a life of holiness, free from sin. It is a project of love that God renews every time we come close to him, especially in the sacraments,” the Pope said. Pope Francis recalled Mary’s humble origins. O Mary help us to believe with greater trust. O immaculate Virgin give us the same courage to be alert to the call of Christ. Encourage us to be alert, not to give into the temptation. O Loving Mother may we have the courage to be "watchmen of the dawn", and give this virtue to all Christians so that we may be the heart of the world in this difficult period of history. Virgin Immaculate, Mother of God and our Mother, pray for us! “Where shall the word be found, where shall the word resound? Not here, there is not enough silence.” These words of T. S. Eliot came to mind as I began to think about the season of Advent, which begins this year on Sunday, November 29th . Silence is an integral element of communication; in its absence, words rich in content cannot exist. In silence, we are better able to listen to and understand ourselves; ideas come to birth and acquire depth; we understand with greater clarity what it is we want to say and what we expect from others; and we choose how to express ourselves. By remaining silent, we allow the other person to speak, to express him or herself; and we avoid being tied simply to our own words and ideas without them being adequately tested. In this way, space is created for mutual listening, and deeper human relationships become possible. If God speaks to us, even in silence, we in turn discover in silence the possibility of speaking with God and about God. When a profound stillness compassed everything and the night in its swift course was half spent, Your all-powerful Word, O Lord, bounded from heaven’s royal throne. And so the question I would have in mind for you is simply this: is there silence in your life? Are there places you can go where no noise distracts you? Are there times of peace and quiet in your life? Emptiness is a very common complaint in our days, not the purposeful emptiness of the virginal heart and mind but a void, meaningless, unhappy condition. Strangely enough, those who complain the loudest of the emptiness of their lives are usually people whose lives are overcrowded, filled with trivial details, plans, desires, ambitions, unsatisfied cravings for passing pleasures, doubts, anxieties and fears; and these sometimes further overlaid with exhausting pleasures which are an attempt, and always a futile attempt, to forget how pointless such people’s lives are. Those who complain in these circumstances of the emptiness of their lives are usually afraid to allow space or silence or pause in their lives. So here’s an Advent challenge for you: create times and places of silence in your life. We look forward to seeing you at Midnight Mass. Also, we hope to welcome you to our College-Age retreat at Meribah on January 3, 4, 5, 2016.